Most air cleaners return filtered air into the room through a small, noisy outlet. The IQAir HealthPro Plus was designed with 320-degree air delivery to supply more air in more directions without drafts or noise. Other systems create annoying air drafts and restrict the ability of the system to produce fresh, clean air that can fill the room when you need it. 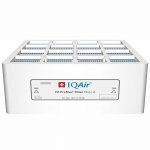 The IQAir HealthPro Series boosts system efficiency by evenly returning cleaned air through a large 320-degree EvenFlow™ vented diffuser. And the wide dispersion pattern allows the HealthPro Plus to produce an astounding air delivery rate with very little noise. Our HyperHEPA filtration technology is the safest, healthiest and most effective way to clean the air. 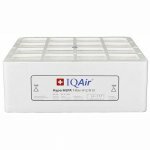 Only IQAir is proven through rigorous independent testing to effectively filter the air down to the 0.003 micron level. And we do it without using unsafe or unproven technologies such as ozone generation, ionization, ultraviolet radiation, chemicals or other unhealthy byproducts. Why risk your health on less effective gimmicks when HyperHEPA filtration offers proven protection without harmful byproducts? Micro-Particle Filtration: After air is drawn in through the air intake, the Pre-Max Pre-Filter eliminates micro-particles such as pollen, pet dander and mold spores. 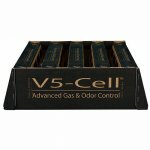 Granular Activated Carbon Adsorption: Next, the V5-Cell Gas & Odor Filter (optional on HealthPro and not available on HealthPro Compact) uses granular activated carbon adsorption to eliminate volatile organic compounds (the cause of odors) and other harmful chemicals. Swiss Made is more than just a label of origin. It is a sign of outstanding quality, uniqueness, superior design, innovation, precision and reliability. In an industry where most air cleaners don't meet manufacturers' claims, we test and certify each and every IQAir air purification system. All our manufacturing is done in our own state-of-the-art Swiss production facility on the pristine shores of the Lake of Constance. By using the highest quality components, a dedicated team of highly skilled and extensively trained craftsmen and women, and state-of-the-art manufacturing processes refined over almost 50 years, IQAir is able to build the finest air purifiers in the world. That’s how serious we are about quality. 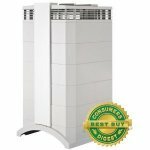 This air cleaner is safety tested and approved for the voltage requirements in the U.S., Canada and Mexico only. This air cleaner will be damaged if plugged into a 220-240V outlet. The use of a transformer or adaptor will not prevent the risk of damage. This product has no warranty coverage when used outside North America.